“We have had it with the old Democratic Party. We’re here for a new vision,” declared activist Rebecca Keel during last week’s public funeral vigil, held in front of the Capitol building. 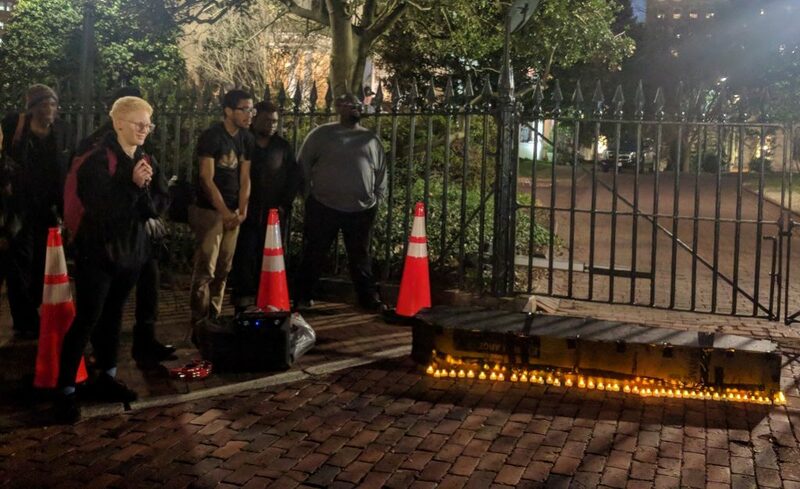 Late last week, at the foot of Virginia’s Capitol building just before dusk, approximately 50 people gathered around a coffin. Members of the group held their phones or notebooks, brimming with prepared speeches. Local activist Rebecca Keel shook a tambourine to keep time as the group marched and sang. Organizers and community members passed around a microphone. They spoke in the direction of the crowd, but their voices projected further, towards the rolling greens and fat, white columns of the Capitol. They were there to mourn what they view as the death of the Democratic Party. 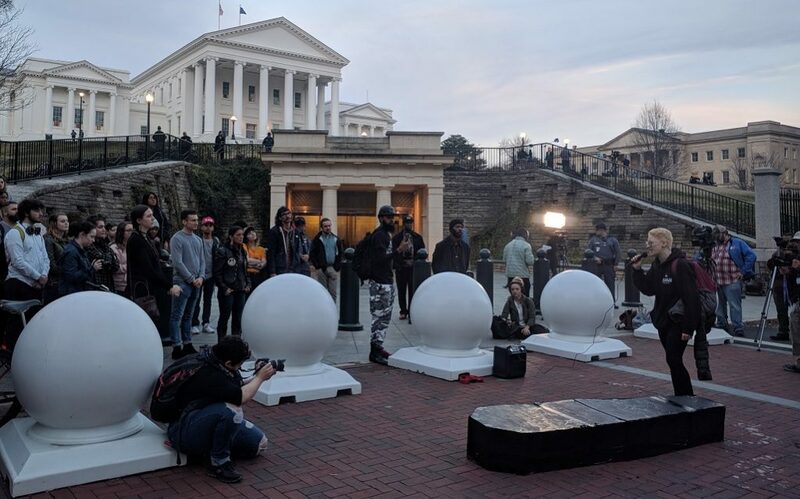 Largely a response to the recent news of Governor Ralph Northam and Attorney General Mark Herring’s blackface scandals, an issue that has been marinating in the news cycle for the past week and garnering national attention, the vigil was about more than these single reprehensible acts by two of Virginia’s leading politicians. 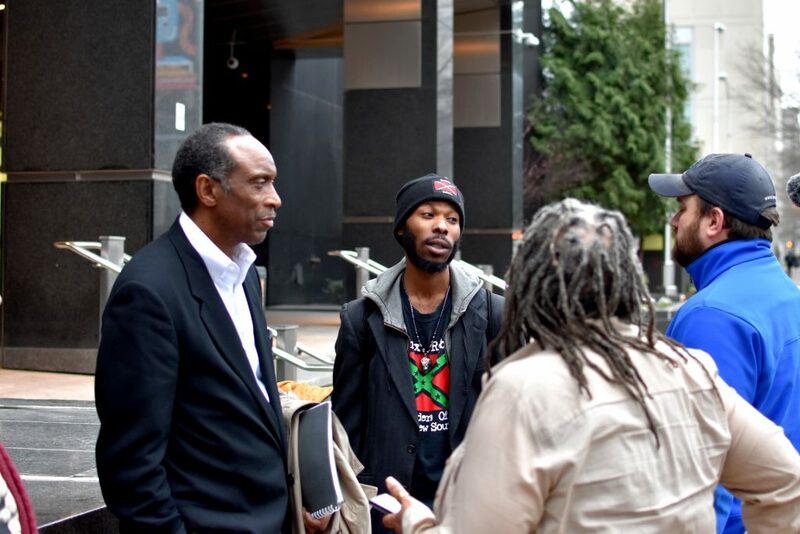 “We know that racism is alive and well, not only in the city, in the state, but across the nation. 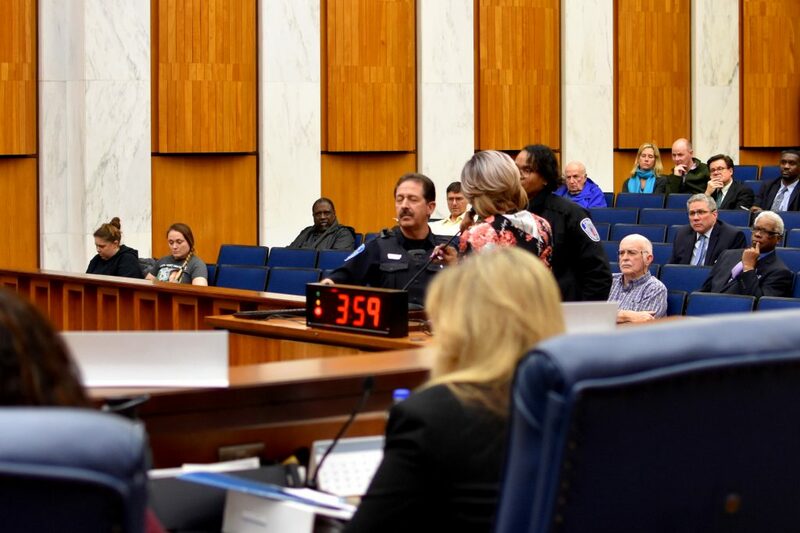 And we see it across the world,” said Arthur Burton, founder of Kinfolk, a community outreach organization focused on Richmond’s public housing sector. A plethora of speakers spoke about the Democratic Party’s hand in past atrocities, from being the cornerstone of slavery in the south to the displacement and murder of indigenous peoples, acts often disregarded by left-leaning people because of the policy changeover and party realignment that took place in the mid-20th century. But the purpose of the vigil, according to the message of the speakers, was to recognize that these values have not been left behind. Keel spoke, for example, about the Northam Administration’s support of the Mountain Valley and Atlantic Coast Pipelines. Although the event was mourning a failure by politicians whom some in attendance had passionately supported and campaigned for, the group was also looking to the future, questioning what a new progressive political party might look like and how to get there. “We actually have to build together,” Brooke Taylor said, Richmond Youth Coordinator at Side by Side, a nonprofit supporting LGBTQ youth. 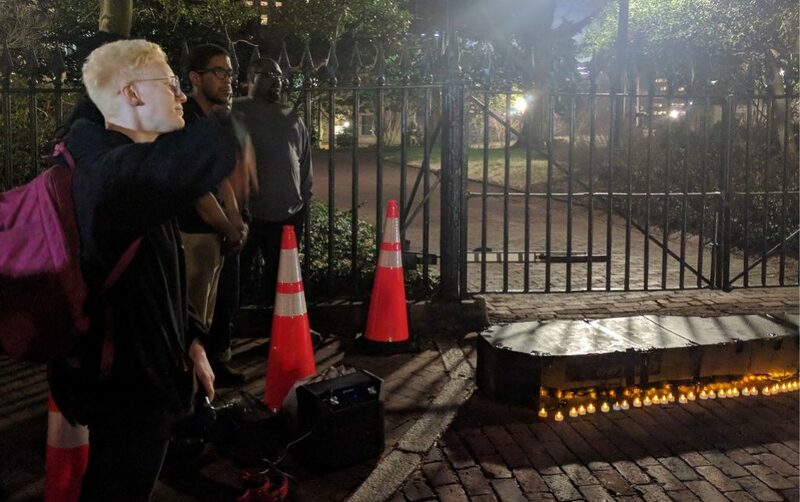 According to Keel, the vigil was organized in tandem with the full-throttle news cycle, coming together in only 36 hours. The event was also honoring Lillie Estes, a local activist and community strategist who died earlier this month. Keel said Estes had been an invaluable mentor to people in Virginia and throughout the East Coast. As the evening grew darker, electric candles were passed around. The sky became a deep blue, and the tops of the towering Bank Street buildings became less pronounced. The brightest thing in view became the Capitol, its face lit stark white against the night. After a heartfelt eulogy from Burton, audience and organizers alike formed a silent procession and marched with the coffin on their shoulders. Snaking up a manicured lawn, backdropped by TV Reporters who’d waited just for this moment, the vigil ended in a quiet spot next to the now-looming Capitol building. One by one, members from the procession came forward to place their candles by the casket. As instructed by Keel, they each whispered or thought an intention of what they wanted from a new Democratic Party. “We’re just tired of being tired, so we are really calling on our Democratic leaders to step up and take up a people’s platform,” Keel said, just before referencing the quickly-approaching 2019 General Assembly elections.